This is my first attempt at spotlighting, I think I got a little off, but sometimes that's me, a little off. 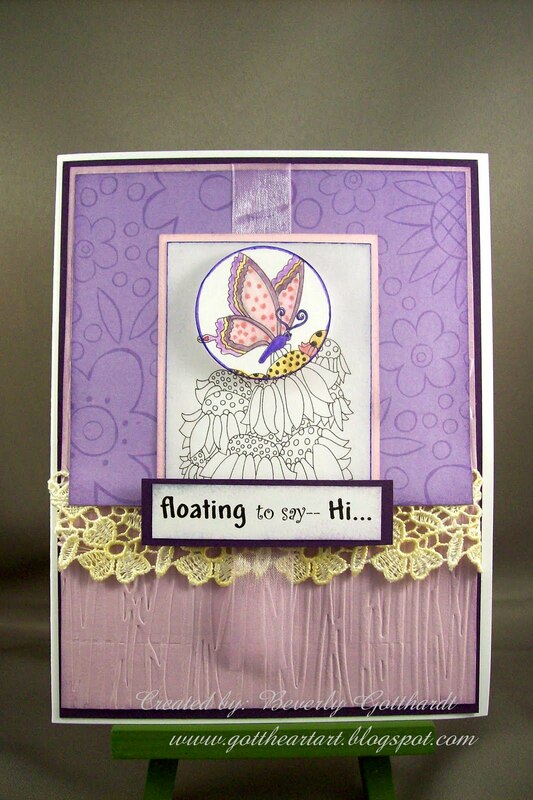 Supplies: White Card Blank 5" X 6 1/2" Halcraft, Papers: Stampin Up-Whisper White, Elegant Eggplant, Perfect Plum, Pink Pirouette, designer paper unknown, Stamp: Paper Pretties-Digital Stamp, sentiment created in PrintMaster 11, Ink: CTMH-Z2161 Petal, Z2110 Buttercup, Stampin Up-Blender Pen, CTMH markers-petal, amethyst, hydrangea, buttercup, blush, baby pink, Cuttlebug embossing folder-Forest Branches, Fiskars shaper cutter template-Circles-1, Lace-Offray, ribbon-Offray, pop dots. What a great technique and you've done a good job with the colours this week. Such a pretty card! And you did a great job spotlighting! Thanks so much for joining us at the DTC this week! You did a super job spotlighting! Great use of our colors this week at PPC! Be sure to stop back in again tomorrow for another challenge! TFS! You did an awesome job! IT is a technique I haven't tried yet, but will soon. You rocked the color combo too. Thanks for sharing your card with us at PPC. 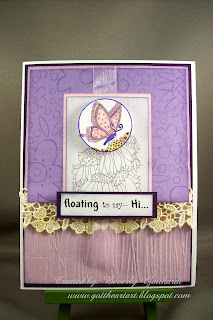 Lovely technique and love the color combo tou have choosen Beverly...love this card..